The first time we heard about the new Famo Half track model from Tamiya,immediately made me think of a diorama. The usual thing that comes to mind is of towing another vehicle, but of course you then have to decide what to use, how many and so on. The first thing I did was to have a rake round the bits box and although I don’t have a lot of 1/35 spares, idid find quite a few useful parts, some of which were still more or less complete. I first found a lot of odd tools and accessories and best of all almost the whole lot of the Italeri field workshop set,i then bought a couple of sets of figures and with the ones I already had set to doing some minor conversions, when I was satisfied with them (14 in all) I put them aside and got on with the Halftrack. 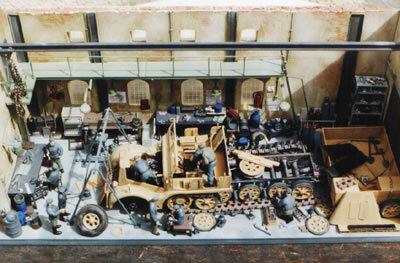 The model was built out of the box except for a few minor changes, these involved leaving a couple of the halftrack wheels off and one of the front wheels the rear axles were then made a bit larger and detail added to the front wheel hub. At a later time when I was fitting together the sub-assemblies I also cut out a couple of the floor panels inside the cab so as to have two of the figures working in it, because of this I also had to extend the gear selector rods under the floor which could then be seen. I finally got the whole model finished and was quite pleased with the end result, now it was time to make the workshop and it was to be fairly basic. First I made the back wall and two ends using all the scrap pieces of 60th card over from earlier large scale models, making inner and outer walls all round spacing them with 1/4 inch scrap pieces and cut the windows into the rear wall, I cut them to this shape because I had some clear ready made windows from an old H.O. scale Railway shed,these were fitted to the rear of the wall and then the door cut out. A walkway was made and added to the rear wall on brackets and handrails from 1mm rod fitted, all lighting conduit and power fittings were made from 1mm and .5mm rod and the lamps and other parts from the bits box. The inner walls were covered with embossed random brick plastic card and the outside and tops covered with polyfilla, the paint inside and out was a made up colour of light stone, all the wall fittings were painted in a medium olive drab and the doors in grey and gunmetal. The overhead gantry is a piece of old plastruct I beam with a made up hook and block fitted, two of the benches were made from 30th card and doors at both ends from 20th card and 80 x 20th strip. I then started adding all the tools,benches etc to the rear and side walls leaving enough space for the Halftrack and figures in the middle, at last all the bits and pieces were in place and some figures were changed around to what I thought were better positions. I really enjoyed doing this diorama as it’s been a long time since I made one, and who knows perhaps i’ll do another soon.